In the collection are: A set of gardening tools, solar garden lights, portable hammock, watering can, herbs, and a composter. Of them all, i’m most intrigued in the composter! 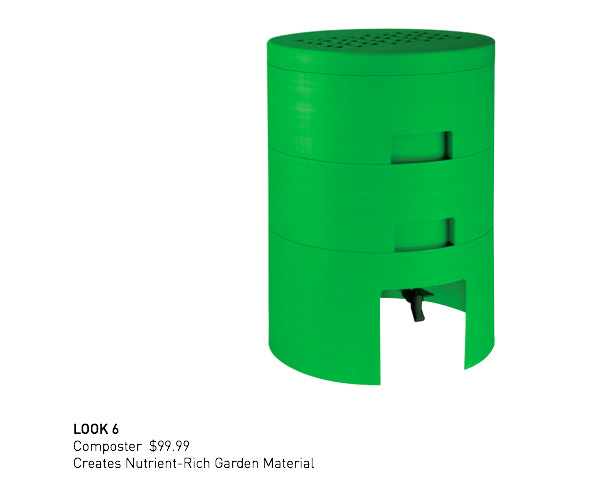 After much hunting, there doesn’t seem to be much in the realm of attractive composting hardware out there ~ this bright green piece is so playful and refreshing! Check out the full collection larger and the full press release on the next page! The collection will be available starting April 12th. 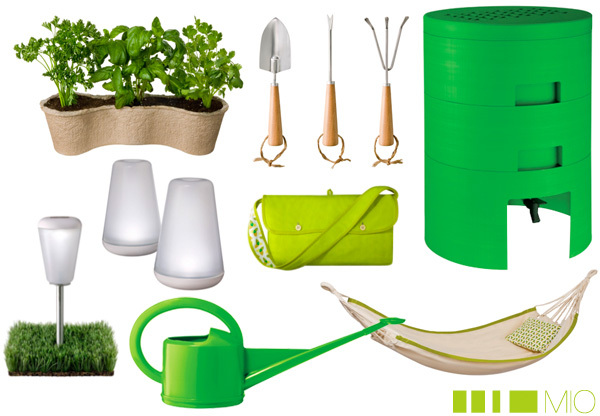 MINNEAPOLIS (April 12, 2009) - This spring, Target® introduces MIO® for Target, an innovative collection of environmentally responsible outdoor living products. 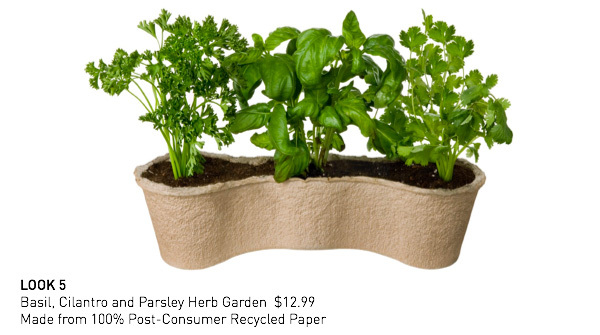 MIO, known for its focus on green design, infuses sustainability into practical, functional items for Target. The assortment will be available on April 12 for a limited time at Target stores with select items available on Target.com. 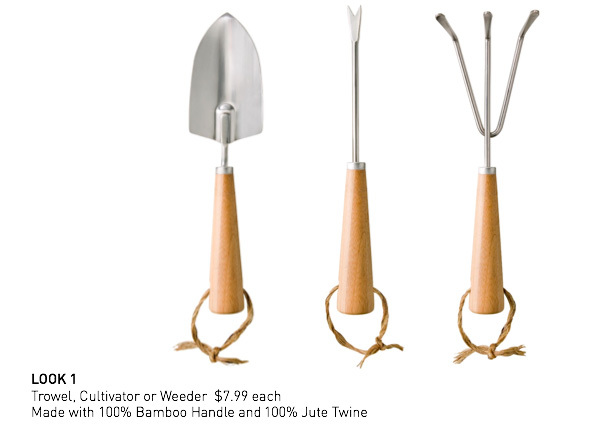 The product assortment includes eight outdoor items made from recycled and renewable materials at an unbeatable value including a watering can, trowel, cultivator, weeder, mini herb garden, solar lights, hammock and composter ranging from $6.99 for the trowel to $99.99 for the composter. For MIO founders and brothers Isaac and Jaime Salm, sustainability is more than just a buzzword - it’s a mission. MIO products aren’t green because it’s trendy; they are green because it’s responsible and efficient. Minding the impact of materials, processes, and the complete life cycle of every product, MIO strives for sustainability at every level. The company’s unique green solutions have been embraced by boutiques, designers, museums and more. For more information about MIO for Target visit http://www.target.com/. Minneapolis-based Target Corporation (NYSE:TGT) serves guests at 1,699 stores in 48 states nationwide and at Target.com. Target is committed to providing a fun and convenient shopping experience with access to unique and highly differentiated products at affordable prices. Since 1946, the corporation has given 5 percent of its income through community grants and programs like Take Charge of Education. Today, that giving equals more than $3 million a week. Thanks for the heads up on this! 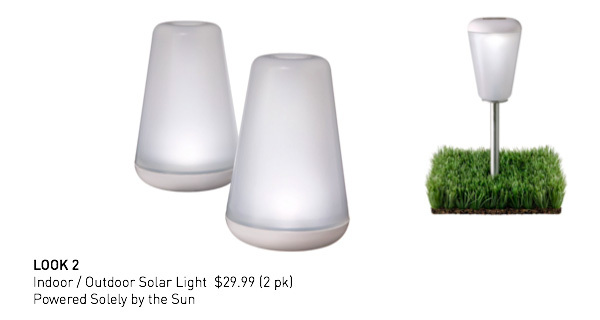 I bought the solar lights for my mom on mother’s day and she loves them. Keep up the good work.